You’ll feel like a glamorous pin-up girl when you step out in this alluring bodycon dress. The Glamorous Open Back Lace Bodycon Dress is fully lined and crafted of a silky, curve-hugging fabric. Lace lines the neckline and straps of this dress and makes up the bust. Lace detailing throughout the body of this dress forms an elaborate design and adds to the lingerie-inspired look of this dress. An open back adds an unexpected flirty touch. This dress is perfect to wear out on date-night with someone special. 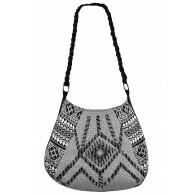 It would look perfect paired with pumps and some pretty jewelry. Details: Fully lined. 88% polyester, 12% spandex. Hand wash cold water separately. Line dry. Cool iron on reverse. Small measurements: Length from top of shoulder to hemline: 35”. Bust: 32-34”. You have added Glamorous Open Back Lace Bodycon Dress in White into Wishlist. You have added Glamorous Open Back Lace Bodycon Dress in White for Stock Notification. 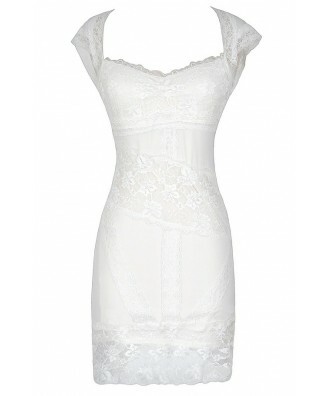 You have set Glamorous Open Back Lace Bodycon Dress in White as a loved product. 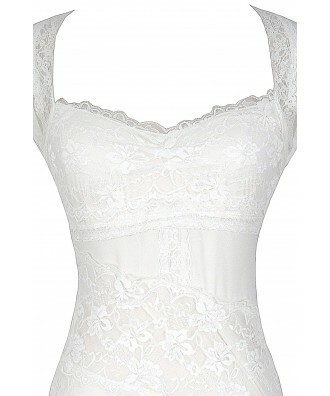 You have removed Glamorous Open Back Lace Bodycon Dress in White as a loved product.